A special Limited Edition WindyWings release, we thank Exhart for giving us the classic and often requested White Swan Garden Stakes! 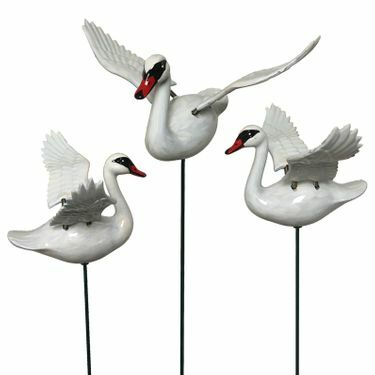 These special swanlings with complement your color flower bed and add just a touch of whimsy and class. In full white plumage with the patented springed wings, these WindyWings will add a bit of motion and elegance. Pairs nicely with our ever-popular Flamingo Stakes. Size: 3.5" Swans, 6" Wingspan, stands 14" tall.